© 2014 ZeniMax Media Inc. Developed in association with MachineGames. MachineGames, Bethesda, Bethesda Softworks, ZeniMax and related logos are registered trademarks or trademarks of ZeniMax Media Inc. in the U.S. and/or other countries. Wolfenstein, the W (stylized) and related logos are registered trademarks or trademarks of id Software LLC in the U.S. and/or other countries. All other trademarks or trade names are the property of their respective owners. All Rights Reserved. 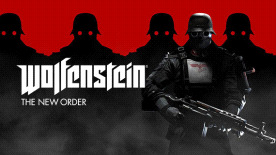 Wolfenstein®: The New Order is a fictional story set in an alternate universe in the 1960’s. Names, characters, organisations, locations and events are either imaginary or depicted in a fictionalised manner. The story and contents of this game are not intended and should not be construed to in any way condone, glorify or endorse the beliefs, ideologies, actions or behaviour of the Nazi regime or trivialise its crimes.